This area lets you select which Quick Editor should be used when you use the Quick Edit button on the toolbar or press the Ctrl+Q key combination. You can chose either the Internal or External Quick Editor to be the preferred one. (The other one would be set up as the alternative Quick Editor, accessible via the Ctrl+Shift+Q key shortcut). 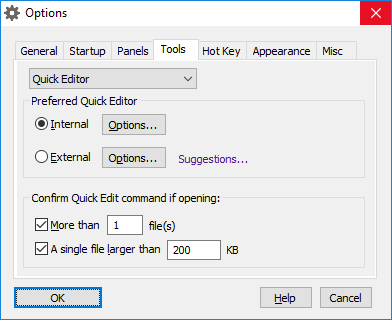 If selected, these options will display a prompt for a confirmation if you attempt to open a large file or several files with Quick Editor. You may find this option of use if you often use Quick Edit command inadvertently.